We are about to be serious…but meanwhile, there are cookies and pies! The excitement here at Drammy Towers today is palpable! This evening sees the first meeting of our annual five (before Memorial Day) in which we gather to discuss this season’s shows that have already closed (please remember that “this season” for us dates back to mid-May), and to record our early nominations. Tomorrow or the next day we will post here the list of productions that were included. Do check it out, and let us know if you feel something is missing. It’s possible that we can explain why (one of those eligibility issues, perhaps) and it’s frankly good to be able to do that as we go along. Of course we don’t actually MEET at Drammy Towers (well, why would we? That is our everyday abode, and it’s nice to have a change of pace). Instead, we sit around the splendid table and in the incredibly comfortable and rather BOUNCY chairs provided by the generous law firm of Tonkon Torp LLP, to whom we are eternally grateful. Meanwhile, before real gravitas sets in, we have a dilemma in our Rogue Awards department. 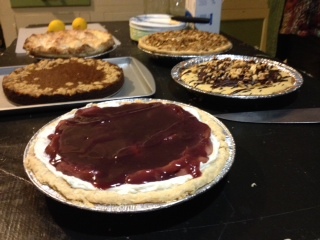 An anonymous person WHO WAS ACTUALLY INVOLVED IN THE SHOW has nominated the incredible pies that were recently served up at a PushLeg production that took place at Portland Actors Conservatory. There are SEVERAL Drammy no-nos involved here. First, anyone involved in a show (or with a close friend or family member so involved) may NOT nominate, discuss, or vote on any aspect of said production. Second, the show, though not a PAC production, nevertheless took place at PAC, which is an educational establishment and we don’t cover educational establishments. And third, the pies themselves changed every night. That sounds weird. I mean, different pies were served every night, and I believe they came from different bakeries. So they didn’t fulfill the rule of “eight productions not including previews.” So really, on all those counts, they should be disqualified. And yet it must be said that the pies were AMAZING. And that, as we are making up our own rules here, we can do what we like. A special award, perhaps? Who knows!? So, as we mull this over, here is a photograph. Judge for yourselves. 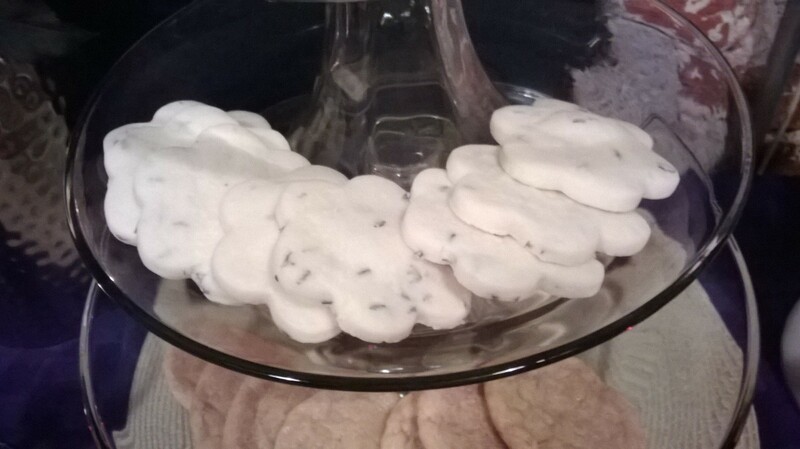 Finally, for today, we are considering…but aren’t absolutely SURE about…nominating the lavender shortbread cookies at the Shoebox Theatre. We love the lobby there, and the fact that the snacks are all available on the honor system. Nothing honestly rises to the level of the amazing ice cream sandwich at Lakewood. But these cookies are subtle and sweet, yet not TOO sweet. We aren’t certain they will be included in the final four, but we are not excluding them for now. We welcome the votes and opinions of others. Here they are. That’s it for the fun stuff. Now back to the serious matter of actual productions. Watch this space for the list of plays we discuss this evening. And see you at the (wonderful Portland) theatre! Please note that in our original post we said we meet five times before Labor Day. Of course we meant MEMORIAL Day. Apologies for the confusion. This has now been corrected. The writer of the post hails from another country and confuses these many American holidays. Join us for Guy Fawkes, anyone? PreviousDrammy (not really) nominations begin here!